Welcome to the Cherry Creek Schools Foundation! For 26 years, we have supported Cherry Creek Schools students and educators through grants, scholarships, events, and programmatic funding for school and districtwide initiatives. We rely on generous donors like you to continue to make Cherry Creek Schools one of the best districts in the state. Our focus is on IMPACT, INNOVATION and OPPORTUNITY for all 55,000 students at Cherry Creek Schools. Since our founding, we have raised more than $9 million toward our mission. Let's work together to continue to bring 21st century learning into every classroom so that all of our students are prepared for success. Take part in our American Furniture Warehouse store rally May 2019! 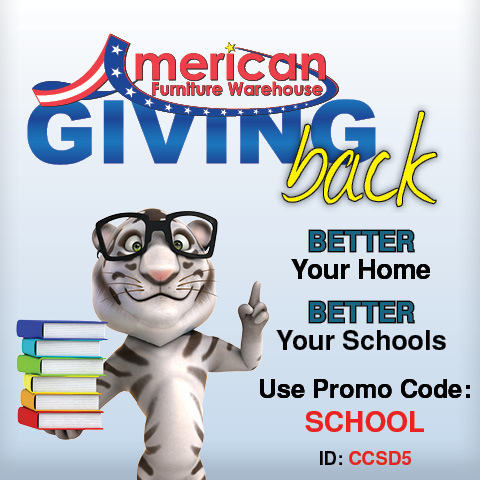 CCSF has teamed up with American Furniture Warehouse to raise money for our neighborhood schools. Up to 4% of your purchase at any location or online will be donated to the Foundation. Whether you're redecorating your home or sprucing up the office, your purchase can help make a difference in the lives of students and educators. Make sure to mention us at checkout or use promo code SCHOOL online! Shop during our community rally May 3-12, 2019! Stay connected to the Foundation! Whether you're an existing or soon-to-be donor, an educator, business leader or community member, you can stay connected to Cherry Creek Schools Foundation by registering for our monthly newsletter. Stay up-to-date on grant deadlines, see how your donor dollars are being spent, learn about the incredible stories of innovation inside classrooms across the district and watch for discounts to your favorite sports teams for our community nights! Come to a Community Night! Get discount tickets to all your favorite Colorado sports teams, like the Colorado Rockies, Denver Nuggets, CU Buffs, Colorado Avalanche, Colorado Rapids and more! A portion of each ticket is donate back to the Foundation and is used to enrich the lives of students at Cherry Creek Schools. While every one of our partnerships has measurable impacts on our programmatic reach, one of those standout corporate partners who has played an essential role in supporting student achievement at Cherry Creek Schools is Enterprise Rent-A-Car, the flagship brand of Enterprise Holdings. "Thank you so much for funding Peak Academies! You are providing EVERY student in our building the opportunity to have experiences they may not otherwise have. On behalf of the staff and the students at Red Hawk Ridge, THANK YOU!"